The Master Gardeners of Stephenson County have recently installed a rain garden at the Stephenson County Visitors Center on Highway 20 east of Freeport. The rain garden is located at the north east corner of the building. A rain garden is a shallow depression that creates a temporary wetland. It is planted with native plants and is designed to collect the runoff from a roof, drive way or parking lot. This allows the storm water runoff to soak into the ground. Reduce flooding, erosion and storm water system usage. Protect local stream and lakes from storm water pollutants. Increase the amount of water that infiltrates into the soil to recharge groundwater. Rain gardens allow about 30% more water to infiltrate compared to a comparable patch of lawn. Rain gardens hold water temporarily. They are not ponds. Instead they fill with water after a rain event and the water slowly infiltrates into the soil. Rain gardens should be planted with water tolerant native plants. 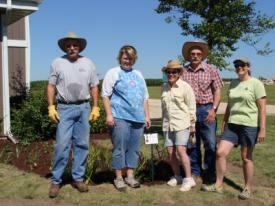 We met on site on June 11 to tweak some of our plans for the rain garden. We decided to turn the garden a different direction and work it into the existing landscape. This design would enable the garden to sit directly off the downspout at the north east corner of the building allowing it to fill easily without having to construct a swale to direct the water. The design also makes it simple for the lawn mowers to mow around. Its sweeping curves tied into the existing landscape make it easy to mow around without any additional trimming. The existing landscape was wide enough that it allowed us to set the rain garden ten feet away from the building foundation. We decided that we should rent a sod cutter for construction day so that existing sod could be used on the outside of the berms. June 24 was site construction day. We started the day by using a sod cutter to remove the sod from the site. The sod was rolled up for use at a later date. The site was dug to a depth of 12 inches. Some of the soil was used to build up berms surrounding the rain garden. The remainder of the soil was left in the rain garden to mix with the soil amendments. Planting date was scheduled for July 2. We met on site to work the soil amendments (top soil and mushroom compost) in to the existing soil in the garden. We used some topsoil to top dress the berms and smooth them down to ground level. The outer edges of the berms were planted with the sod that was taken off of the site. After the soil amendments were in, the garden was still about 8 inches deep at the east end and about 6 inches deep at the west end. We planted, mulched and watered the garden in. The following weeks took several trips to the garden to water the transplants and the sod. The garden took hold and looked good in very little time. We had some weed concerns but we were on site often enough to keep the weeds under control by handpicking them. Overnight on July 22 into the morning of the 23 we had 6 to 7 inches of rain followed by another 6 to 7 inches of rain on the evening of the 23rd of July. Most of the county was suffering from flooding. We were concerned about the rain garden but it seemed to handle the water well. From what we can tell the garden was full during this time frame but handled the water without damaging the garden or the surrounding berms. The rain garden built by the Master Gardeners at the Stephenson County Visitors Center has the following plants: Cardinal Flower, Sweet Flag, Wild Blue Flag Iris, New England Aster, Joe Pye Weed, Golden Alexander, Soft Stemmed Bullrush, Prairie Blazing Star, Sweet Blackeyed Susan, and Fox Sedge. For more information about the rain garden built by the Master Gardeners contact the U of I Extension-Stephenson County at (815) 235-4125. Some useful information about rain gardens is located at www.raingarden.il.gov. Rain Gardens a how to manual for homeowners can be accessed at: http://www.dnr.state.wi.us/org/water/wm/dsfm/shore/documents/rgmanual.pdf. This publication has great pictures on how to create a rain garden and excellent plant lists to use for a variety of garden sites. This rain garden demonstration project was made possible by grant funds from the Illinois Department of Natural Resources, the Illinois Conservation Foundation, and the U.S. Fish and Wildlife Service.